T his study analys ed the effect of change implementation capacity, one of the intangible variable of dynamic capabilities , on the firm performance. The study also provided the additional insight in understanding the direct relationship between change implementation capacity and firm performance, and indirect relationship with the moderator of high volatile environment surrounding the retail firm’s business. The data from SMEs of retail firms o perating in Malaysia were analys ed using Structural Equation Model (SEM) statistical software. The results reveal ed that change implementation capacity influenced the retail firm s to achieve greater performance and high volatile environment which positively impact the performance. Change Implementation Capacity, High Volatile Environment, Dynamic Capabilities, Retail Firm Performance, SMEs. The retail business, as many other SMEs subsectors, plays significant role in many economies in term of providing significant number of jobs. This scenario, in turn contribute extensively to national gross income is deemed an essential part of SMEs’ entrepreneurial effort. This sector generated USD 20,002 billion revenue in 2017 across the globe (Research and Markets, 2017). The retail business entails undertakings of purchasing and selling merchandises or commodities directly to customers for personal consumption and non-business use. The commodities include groceries and non-groceries which cover food and beverages, apparel, electric and electronic appliances, furniture and furnishing, mobile and IT, pharmaceuticals personal care, and others (Kotler et al., 2009; US Census Bureau, 2017). Change Implementation Capacity (CIC) may be a crucial construct in understanding the dynamic capability of firms in surviving certain business ecology and growing continuously, when other may fail (Batra, 2016). Even a firm which possess certain capabilities may not achieve better performance especially during high volatile environment because of the inability to redeploy the right strategies and correct types of capabilities (Ahmad Zaidi and Othman, 2014). In short, during high volatility of environment, if not adapted well may diminish the capability of a firm in maintaining its performance. It is characterized as the unexpected and rapid change as well as unpredictable demand, especially the trend for the worse (Hannan and Freeman, 1977; Pratono and Mahmood, 2016). This study examined the role of high Volatile Environment (VE) in the complex relationship between CIC and retail Firm Performance (FP) in Malaysia. By examining the direct relationship and the moderating effect of VE, we contribute to the literature in three-fold. First, this study of performance determinant in the retail sector is beyond the traditional perspective, which mostly focusing on mature developed or western countries (Gupta and Batra, 2015)-we have extended it to emerging and developing country. Second, we shed additional view on the rapid changes of markets, unpredictability of customer’s demand, competitive intensity and necessity of ad-hoc or frequent management decisions and perform change-influence the relationship between CIC and FP. Finally, we provide empirical evidence that flat and low hierarchical functional structure of retail firms alleviate the change implementation effort compared with large firms (De Clercq et al., 2013). 1. Does Change Implementation Capacity (CIC) have a significant and positive relationship on retail firm performance? 2. 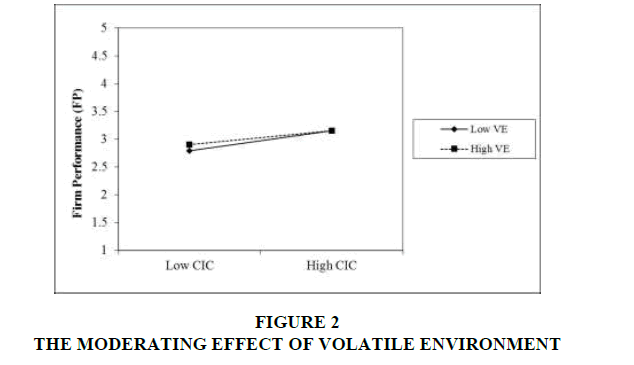 Does high Volatile Environment (VE) moderate the relationship between CIC and retail firm performance? Therefore, this research aimed to determine the effect of change implementation capacity towards retail firm performance during the high volatile environmental (moderating effect) which is anticipated to instil additional insight in body of knowledge. Current global economy refers to highly volatile environment in which almost all sectors of businesses are affected. Many retailers are in tremendous pressure with cash flow crash, failure to react against the rapid market changes, uncertainty of customer preference and demand. Retailers who operate conventional businesses with large physical entities are the most affected. A report by Cushman and Wakefield, a research firm indicated that number of customers visiting shopping malls dropped by 50 percent between 2010 and 2013, and the downtrend still continued until 2017 (Peterson, 2017). Many factors contribute to the so-called “retailpocalypse” such as global recession, changing pattern of shoppers spending and incremental of e-commerce usage. These factors pose financial distress among retailers with additional issues like higher rental, low currency rate, increased staff cost, rising fuel and merchandize prices (cnbc.com, 2017). In Malaysia, the introduction of universal Goods and Services Tax (GST) in April, 2014 and weak currency have increased the goods prices and consequently reduced the people’s purchasing power. A further worsening the scenario was the subsidy of fuel was abolished in December, 2014 and float mechanism introduced. In February, 2017, the Consumer Price Index (CPI) increased to 4.5 and inflation rate capped at 4.5 percent. Rationalization of basic need items’ subsidy by government and higher cost imposed by manufacturers due to transportation and fuel price hike have resulted the production cost shifted to consumers. This scenario causes a chain reaction where the purchasing confident level becomes low and retailers’ revenue drop significantly (Cooper, 2017; Geoghegan, 2017). The impact of highly volatile ecosystem burdened the retailers where swift change capability will determine their future. Are change beneficial and the best alternative for organizations during high volatile environment? While established and large firms relatively believed the benefits gained from situational change, SME firms have less exposure on the activities and change strategy. Batra (2016) revealed that change strategy and ability of firms during turbulence environment (which is called change implementation capacity) will determine the survival and growth of a firm; but radical change towards strategic posture might become fatal. Additionally, Ahmad Zaidi and Othman (2014) found that if a firm simply possessing certain capabilities but unable to redeploy the correct types, it might not achieve better performance especially under high volatile environment. This study utilized the Dynamic Capability View (DCV), an extension of Resource-Based View (RBV) theory. Teece et al. (1997) originated this theory with the argumentation of why certain firms still perform during high volatile environment, filling the gap of RBV. The theory addresses the necessity of firms to develop dynamic capabilities by leveraging their resources and adapting to rapid changes environment (Hakala, 2011). Thus, DCV indicates the necessity of the top management capability in redeploying, reconfiguring and recombining their resourcebase during high volatile environment, expecting firm to act swiftly and response to rapid frequently (Azadegan et al., 2013; Kantur, 2016; Singh and Rao, 2017). Change Implementation Capacity (CIC) is one of the diverse compositions of Dynamic Capabilities dimensions that have been discussed by many researchers. Other dynamic capabilities dimensions that are recently discussed are alliance management capability, new product capability (Schilke, 2014), change implementation capability, strategic sense making capability and timely decision-making capacity (Li and Liu, 2014), integrative capability and operational capability (Jiang et al., 2015). Additionally, Killen and Hunt (2013) listed 77 different dynamic capabilities in their meta-analysis review. Their study suggested that some of the capabilities have higher impact on performance than the others, and hence, companies must choose relevant capabilities to suit their stakeholder's needs. Furthermore, as the part of dynamic capabilities CIC implicates the top management skills to sense opportunities and threats, transfer and modify (Li and Liu, 2014) all the resources, skills and competencies to adapt to the changing environment. Redeploying and reconfiguring resources are the skills and capabilities that endure the rapid and uncertainty situations where not all firms possessed them. Firms with greater CIC will benefit more in their performance achievement compared with others in this kind of environment volatility because CIC is a valuable, rare, inimitable, and non-substitutable asset (Eisenhardt and Martin, 2000; Morgan et al., 2009). Additionally, a few scholars argued that these capabilities are worthless during stable environment (Wu, 2010; Miles, 2012). Further, Li and Jiu (2014) indicated the importance of any firm to invest and develop dynamic capabilities in addressing the environment changes. Their findings reveal that the dynamic capabilities are valuable and crucial for attaining competitive advantage with cross effect on organizational performance. Conversely, Nedzinkas et al. (2013) found that there is no significant relationship between dynamic capabilities and financial-related performance. However, dynamic capabilities show significant relationship with non-financial performance. Therefore, it is necessary to test any of the capabilities with a different blend of variables which may possibly substantiate the firm performance. Consequently, in uncertain and rapid changing market conditions, results from few studies argued the importance of integrating dynamic capabilities (Schilke, 2014; Jiang et al., 2015) in order for firms to adapt with the environment and survive (Martin & Rialp, 2013). Many study of environmental volatility are measured from various factors such as of instability of markets, unpredictability of industrial changes, uncertain of customer demand, intensity of competitions, change of customer preference and entry and exit difficulties of the industry (Azadegan et al., 2013; Ruiz-Ortega et al., 2013; Gupta and Batra, 2015; Pratono and Mahmood, 2016). Miller (1983) viewed the environmental volatility from the amount and rate of change as well as unpredictability of markets. Low volatility is reflected by fewer occurrences of market changes and well-anticipation by players. In addition, high volatility is represented by the continuous, rapid and unpredicted changes (Martin and Rialp, 2013). As a result, the volatility of environment may alter the purchasing behaviour, price sensitivity and product preference (Grimmer et al., 2015). This study incorporated two proposed hypotheses that emphasized on the effect of CIC on the FP. Heckman et al. (2015) argued that firms should carefully invest and develop in change implementation capacity because of obvious positive impact on project performance. Moreover, in their study on 140 manufacturing firms in Germany verified that change capacity positively influences the performance. The study was conducted during the high level of competitive intensity situation but the majority of respondents had extensive level of past experience in change initiatives. However, it also found that firms encountering higher technological turbulence show weaker performance achievement. Decker et al. (2012) revealed that many organizations fail to implement change successfully. It is not uncommon as the past researches indicated change implementation failure rate as high as 93% for certain organizations. The rate still persists even with some alignment within organisation such as modifying organisation culture, enhancing decision making or alter change management techniques. H1: There is a significant positive relationship between Change Implementation Capacity (CIC) and FP of retail firms in Malaysia. Based on the inconsistent findings from previous studies, the effect of environment volatility especially on the high Volatile Environment (VE) is worth studying in order to better understand the relationship between CIC and FP. Currently, there is two contradicting views of the role of environment volatility in the relationship between CIC and firm performance. First view suggests that high VE significantly moderates the relationship between predicting construct and FP, indicating the needs of firms to adapt with changing environment to maintain their competitiveness (Azadegan et al., 2013; Al-Nuami et al., 2014). The second view proposes that external environment volatility has no moderating effect. Instead, the performance is characterized by internal environment such as by firm characteristics, human resources and financial availability (Kultumus and Warner, 2015; Grimmer et al., 2015). H2: The relationship between CIC and FP is moderated by high VE. The study utilized quantitative approach in which data were initiated through three phases namely development stage (questionnaire development and pilot study), implementation (sampling, distribution and collection of a questionnaire) and analysis or validation stage (quantitative data analysis and hypotheses testing). A standardized set of questionnaire was developed which offered structured and closed questions for self-administered respondents. The seven-point Likert scale was used to measure dichotomous responses ranging from strongly disagree to strongly agree for independent, moderator and dependent variables. All the measures were adapted from the previous studies. The measures of FP were derived from the subjective tangible and intangible elements namely satisfaction with financial and nonfinancial success which includes profitability, market share, sales growth, customer satisfaction and customer growth. These elements were chosen because they are main reflective of performance in the mainstream studies (Suliyanto and Rahab, 2012; Gruber-Mueckle and Hofer, 2015). The CIC measures the reconfigure resources capability and change implementation strategy (Li & Liu, 2014), whereas high volatile environment reflects competitive intensity, predictability and rapid market changes (Prajogo, 2016). SME firms were the samples for this study. The SME were selected under the distributive trade category which is listed with Malaysian SME Corp database. There were 13,685 registered firms in central region of Malaysia as the identified population in 2015. Based on Dillman’s (2007) formula, the sample sizes of the respondents that represented the overall population were 373. Sampling technique used was stratified random sampling in which population was calculated according to the number of the retail establishments versus the number of states in Malaysia. The study applied cross-sectional method. A structured questionnaire was emailed to the owner-managers of the retail firms for approximately 90 days with two interval written reminders issued. 154 surveys were returned in which 152 are useable for analysis and regression. This represented valid response rate of 40.7 percent. Path modelling analysis using Partial Least Square-Structural Equation Model (PLSSEM) was executed in testing and regressing the data. Variance-based SEM (PLS-SEM) is appropriate for variables exploratory especially when the new independent, moderator or mediator variables are being introduced to a common accepted framework. It works very well with both low and high number of respondents (Hair et al., 2014). In order to test the theoretical framework and hypotheses, multiple-variation regressions were performed using PLS-SEM. PLS-SEM has increasingly gained interest of current scholars due to its user-friendly, applicability and versatility in analysing and interpreting results of a research (Hair et al., 2014). Structural Equation Modelling (SEM) has been a preferred tool for survey-based research since three decades ago (Djikstra and Henseler, 2015). Researchers utilize SEM abilities, for example, modelling the latent variables and adjusting measurement error. Another advantage of PLS-SEM application is ability to regress the multiple variables (independent, moderator, mediator and dependent variables) simultaneously compared to SPSS which is limited to regression relationships between an outcome variable and one or more variables. 1. When the goal of research is to recognize key driver constructs or predict key determinants constructs. 2. If a structural model involves formative constructs. 3. When a structural model is complex. 4. When a sample size is reasonably low. 5. If there is non-normality of data. The PLS-SEM regression resulted in two sets of linear equations for path modelling, namely measurement model (outer model) and structural model (inner model). The outer model assessment consists of ascertaining individual item reliability, determining internal consistency reliability and examining convergent and discriminant validity of the constructs (Hair et al., 2017; Imam and Hengky, 2015). Furthermore, an inner model focuses on hypotheses testing which applies a standard bootstrapping procedure by PLS with a large subsamples (5000) regressed, one tailed test type and 0.05 significant level to determine significance of the path coefficients (Hair et al., 2017). Moderating effect was analysed using three procedures proposed by Hair et al. (2017). Three procedures comprise of: (i) model of direct interaction, (ii) the model with the moderating effect, and (iii) a change in R2 evaluation. These three procedures were applied to identify the interacting effect of high Volatile Environment (VE). 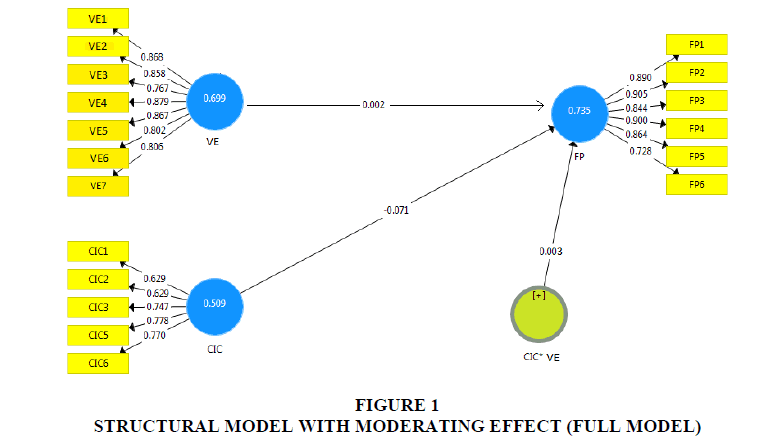 In this study, the moderating interaction effect evaluation was applied through a product indicator approach (Hair et al., 2017; Henseler and Chin, 2010) in order to determine and assess the strength of the moderating effect of high Volatile Environment (VE) on the relationships between Change Implementation Capacity (CIC) and the Firm Performance (FP). Interaction term of product indicator is deemed appropriate if a moderating variable is continuous (Rigdon et al., 1998). Hence, to ascertain the interaction effect using the product indicator, the product terms (calculation method) between the indicators of the latent variable and the indicators of the latent moderator variable must be accounted for. Moderating effect exists if the interaction term is significant (Hair et al., 2017; Imam and Hengky, 2015). SEM-PLS examine the individual reliability for all constructs (Duarte and Raposo, 2010). It is crucial to achieve the value above 0.708 for individual outer loading (Hair et al., 2017) so that it will lead to more than 0.50 AVE (0.7082 is slightly equal to 0.500 AVE). However, in the case of an outer loading’s value falling within the range of 0.40 to 0.70, Hair et al. (2017) argued that it is acceptable so long as the item’s loading still contributes to AVE value of more than 0.50. For this study, all the individual items met the specification of reliability (outer loadings and AVE) were determined. For the internal consistency reliability, Imam and Hengky (2015) suggested that composite reliability should be used to measure each construct instead of Cronbach’s alpha. This is due to Cronbach’s alpha designates all items as equally reliable and this will lead to reliability value miscalculation. In contrast, the composite reliability determines each item individually and value of more than 0.70 is acceptable for confirmatory research (Hair et al., 2017; Imam and Hengky, 2015). The results of the test revealed that all the composite reliability stood between 0.837 and 0.943 indicating that all items are measuring the same constructs and deliver consistent results of above the 0.70 threshold (Bijttebier et al., 2000; Sun et al., 2007). Moreover, convergent validity can be evaluated by examining the outer loadings of the indicator (item loadings) (Duarte and Raposo, 2010; Hair et al., 2017) and the AVE (Fornell and Larcker, 1981; Hair et al., 2017). The outer loading shows how much of the phenomenon have in common with the latent construct. The higher the outer loading, the higher the indicator has something in common with the construct (Hair et al., 2017), and in effect, the more valid the latent construct is. In this measurement model, the outer loadings are between 0.598 and 0.905. The accepted AVE value should be above 0.50 (Ramayah et al., 2018) and this study has fulfilled the requirement. Therefore, all the necessary tests for determining reliability and validity of items and constructs were established for this study. Table 1 summarizes the results for individual item reliability, internal consistency reliability and convergent validity tests. For the inner model assessment or hypothesis testing, this study applies standard bootstrapping procedure by PLS with regression for large subsamples (5000), one tailed test type and 0.05 significant level to determine the significance of path coefficients (Hair et al., 2017). Figure 1 depicts the estimates for the full structural model including the moderating effect (VE) (Figure 1). Table 2 illustrates the results of the direct path and interaction effect of high VE on the hypothesized relationships between exogenous construct and the endogenous construct. PLSSEM output indicated that both relationships between CIC and FP as well as moderating effect on relationship between CIC and FP resulted in p-values of 0.041 and 0.003 respectively. Therefore, the results supported the hypothesis 1 where CIC positively influences retail firm performance. Note: **Significant at p<0.05 (one tailed). This further implied that high volatility environment strengthen the positive relationship between CIC and FP. However, during low VE, the existence of CIC is also positively affects FPas depicted in Figure 2. This study has examined the retail firms operating in Malaysia and found that CIC has significant positive effect towards firm performance. The study also revealed that high VE moderates the positive relationship between CIC and FP. It also verifies the important of CIC the important of CIC as shown by previous studies (Tseng and Lee, 2014; Nedzikas et al., 2015; Imran et al., 2016) as well as the significant of moderating effect of high VE (Calantone et al., 2003; Baretto, 2010). This study suggests that firms react better with the high competitive intensity, unpredictability of demand and rapid change provided they are equipped with resources reconfiguration ability and change implementation strategy skills. Notwithstanding with any type of environments, the ability and skill shown through CIC make firms gain sustainable viability and greater performance (2014). This study demonstrates that firms with more change flexibility are more successful in achieving their performance targets. As argued by Tseng and Lee (2014), the degree of capability is found to be consistently synchronized to the degree of performance. This is supported by Judge et al. (2009) that stated firms in transition economy demonstrate positive impact and suggested that the capacity should be executed regardless of firm size. Despite of finding from past studies which indicate that CIC is important during high volatile environment but worthless during stable environment (Wu, 2010; Miles, 2012), this study instead proven that this capacity is still beneficial for both environments. Therefore, these findings added the new insight for the body of knowledge in retailing area. This study also reveals that firm size does not correlate with the relationship between CIC and FP. Thus, any firms equipped with this capability can withstand high environmental volatility as well as during benign situation. This study also benefits policy-makers for exposure and training can expedite human capital expertise as the main drivers for valuable intangible asset of a firm. SMEs or related government agencies should frequently launch training programs and workshops to improve strategic capabilities and educate employees on how to identify and respond to external and internal environment of a firm. These trainings can be conducted for retail practitioners or the modules can be inserted in the technical or higher institutions curriculum. This will create awareness that leads more effective work culture, higher firm performance and business environment readiness. However, there are few limitations when conducting this study. Objective financial data are lacking which restricts an analysis as far as firm’s performance is concerned. It is measured based on the owner-managers’ subjective assessment on the given measures. The opinion of employees and other stakeholders are also not taken into consideration. A longitudinal study by combining perceptions from employees and retail experts may broaden the knowledge in this aspect. Future study should include other variables into the current framework, such as organizational characteristics, strategic orientations dimensions, entrepreneurial attributes, and other external forces surrounding the business establishment. In conclusion, the results show that change implementation capacity influences the retail firms to achieve greater performance and high volatile environment which positively impact their performance. CIC can act as the basis to improve firm performance in the context of retail business in Malaysia. Therefore, retailers should acknowledge that it is their valuable business goal to be adopted because it is deemed suitable for both stable and highly volatile environments. Moreover, the capacity to reconfigure and redeploy organization existing resources becomes the stable source of competitive advantages. This is strengthened by the organizations’ capacity of implementing ad-hoc and frequent changes and making timely decisions based on the changing environments. These are the essence of CIC. As such, it is very important for retail firms to invest and have the human resources that always alert for any circumstances of changing environments. Ahmad Zaidi, M.F., & Othman, S.N. (2015). Organisational capabilities, environment turbulence and NPD performance: A study on Malaysian manufacturing firms. Procedia-Social and Behavioral Sciences, 172, 286-293. Al-Nuiami, M., Idris, W.M.S., Moh’d AL-Ferokh, F.A., & Moh’d Abu Joma, M.H. (2014). An Empirical Study of the Moderator Effect of Entrepreneurial Orientation on the Relationship between Environmental Turbulence and Innovation Performance in Five-star Hotels in Jordan. International Journal of Business Administration, 5(2), 111-125. Azadegan, A., Patel, P.C., Zangoueinezhad, A., & Linderman, K. (2013). The effect of environmental complexity and environmental dynamism on lean practices. Journal of Operations Management. Batra, S. (2016). Do new ventures benefit from strategic change or persistence? A behavioural perspective. Journal of Organizational Change Management, 29(2), 310-319. Bijttebier, P., Delva, D., Vanoost, S., Bobbaers, H., Lauwers, P., & Vertommen, H. (2000). Reliability and validity of the critical care family needs inventory in a Dutch-speaking Belgian sample. Heart and Lung, 29, 278-286. Cnbc.com. (2017). Retail is experiencing ‘a perfect storm,’ analyst says. Cooper, F. (2017). Outlook for the global economy: Slower for longer. Harian Harakah. De Clercq, D., Dimov, D., & Thongpapanl, N.T. (2013). Structural and relational interdependence and entrepreneurial orientation in small and small-sized enterprises: The mediating role of knowledge sharing. International Small Business Journal. Decker, P., Durand, R., Mayfield, C., McCormack, C., Skinner, D., & Perdue, G. (2012). Predicting implementation failure in organizational change. Journal of Organizational Culture, Communications and Conflict, 16(2), 29-50. Dijkstra, T.K., & Henseler, J. (2015). Consistent and asymptotically normal PLS estimators for linear structural equations. Computational Statistics and Data Analysis, 81, 10-23. Dillman, D.A. (2007). Mail and internet surveys: The tailored design method, (2nd Ed.). New York: John Wiley & Sons, Inc.
Eisenhardt, K.M., & Martin, J.A. (2000). Dynamic capabilities: what are they? Strategic Management Journal, 21(10), 1105-1121. Geoghegan, J. (2017). ‘Perfect storm’ to hit retail margin in 2017. Drapers.com. Grimmer, L., Miles, M.P., & Grimmer, M. (2015). A research note on the effect of entrepreneurial orientation on small retailer performance: a resource-advantage perspective. International Entrepreneurship and Management Journal, 11(2), 409-424. Gruber-Muecke, T., & Hofer, K.M. (2015). Market orientation, entrepreneurial orientation and performance in emerging markets. International Journal of Emerging Markets, 10(3), 560-571. Gupta, V.K., & Batra, S. (2015). Entrepreneurial orientation and firm performance in Indian SMEs: Universal and contingency perspectives. International Small Business Journal, 1-23. Hair, J.F., Black, W.C., Babin, B.J., & Kuppelwieser, V.G. (2014). Partial least squares structural equation modeling (PLS-SEM): An emerging tool in business research. European Business Review, 26(2), 106-121. Hair, J.F., Hult, G.T.M., Ringle, C.M., & Sarstedt, M. (2017). A primer on partial least squares structural equation modeling (PLS-SEM), (2nd Ed.). Thousand Oaks, California: Sage. Hannan, M., & Freeman, J. (1977). The population ecology of organizations. The population ecology of organizations’. The American Journal of Sociology, 82(5), 929-964. Heckman, N., Steger, T., & Dowling, M. (2015). Organizational capacity for change, change experience and change performance. Journal of Business Research, 69(2), 777-784. Henseler, J., & Chin, W.W. (2010). A comparison of approaches for the analysis of interaction effects between latent variables using partial least squares path modeling: Structural equation modeling. A Multidisciplinary Journal, 17(1), 82-109. Imam, G., & Hengky, L. (2015). Partial least squares concepts, techniques and applications use the SmartPLS 3.0 program for empirical research. Semarang: Badan Penerbit Universitas Diponegoro. Jiang, W., Mavondo, F.T., & Matanda, M.J. (2015). Integrative capability for successful partnering: A critical dynamic capability. Management Decision, 53(6), 1184-1202. Judge, W.Q., Naoumova, I., & Douglas, T. (2009). Organizational capacity for change and firm performance in a transition economy. The International Journal of Human Resource Management, 20(8), 1737-1752. Killen, C.P., & Hunt, R.A. (2013). Robust project portfolio management: Capability evolution and maturity. International Journal of Managing Projects in Business, 6(1), 131-151. Kotler, P., Keller, K.L., Swee, H.A., Siew, M.L., & Chin, T.T. (2009). Marketing management: An Asian perspective, (5th Ed). Prentice Hall Pearson Education. Kurtulmuş, B.E., & Warner, B. (2015). Entrepreneurial orientation and perceived financial performance. Does environment always moderate EO performance relation. Procedia-Social and Behavioral Sciences, 207, 739-748. Li, D., & Liu, J. (2014). Dynamic capabilities, environmental dynamism, and competitive advantage: Evidence from China. Journal of Business Research, 67(1), 2793-2799. Martins, I., & Rialp, A. (2013). Entrepreneurial orientation, environmental hostility and SME profitability: A contingency proposal. Cuadernos de Gestión 13(2), 67-88. Miles, J.A. (2012). Management and organization theory. John Wiley & Sons Inc., San Francisco. Morgan, N.A., Vorhies, D.W., & Mason, C.H. (2009). Research notes and commentaries market orientation: Marketing capabilities, and firm performance. Strategic Management Journal. Nedzikas, S., Pundziene, A., Buoziute-Rafanaviciene, S., & Pilkiene, M. (2013). The impact of dynamic capabilities on SME performance in a volatile environment as moderated by organizational inertia. Baltic Journal of Management, 8(4), 376-396. Peterson, H. (2017). The dominoes are starting to fall: Retailers are going to bankrupt at a staggering rate. Business Insider. Prajogo, D.I. (2016). The strategic fit between innovation strategies and business environment in delivering business performance. International Journal of Production Economics, 171, 241-249. Pratono, A.H., & Mahmood, R. (2016). Entrepreneurial orientation and firm performance: How can micro, small and medium-sized enterprises survive environmental turbulence? Pacific Science Review B: Humanities and Social Sciences, 1-7. Rigdon, E.E., Schumacker, R.E., & Wothke, W. (1998). A comparative review of interaction and nonlinear modeling. In R. E. Schumacker & G. A. Marcoulides (Eds. ), Interaction and nonlinear effects in structural equation modelling, pp.1-16. Mahwah, NJ: Lawrence Erlbaum Associates. Roberts, N. (2015). Absorptive capacity, organizational antecedents, and environmental dynamism. Journal of Business Research, 68(11), 2426-2433. Rungi, M. (2014). The impact of capabilities on performance. Industrial Management and Data Systems, 114(2), 241-257. Schilke, O. (2014). On the contingent value of dynamic capabilities for competitive advantage: The nonlinear moderating effect of environmental dynamism. Strategic Management Journal, 35(2), 179-203. Suliyanto, S., & Rahab, R. (2012). The role of market orientation and learning orientation in improving innovativeness and performance of small and medium enterprises. Asian Social Science, 8(1), 134-145. Tseng, S.M., & Lee, P.S. (2014). The effect of knowledge management capability and dynamic capability on organizational performance. Journal of Enterprise Information Management, 27(2), 158-179. Wu, L.Y. (2010). Applicability of the resource-based and dynamic-capability views under environmental volatility. Journal of Business Research, 63(1), 27-31.